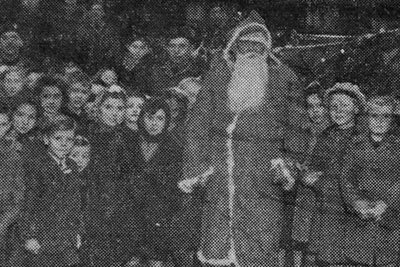 On 27 September (yes, I am nearly 3 weeks behind with my blogging! ), I resumed my bike ride along the Royal Military Canal from where I left off previously. 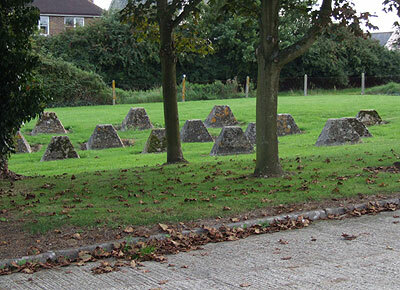 Starting out from Ham Street Station with a list of pillboxes printed out from the Defence of Britain Project Database, my morale was high with the quick discovery of this Type 24 just down the road. 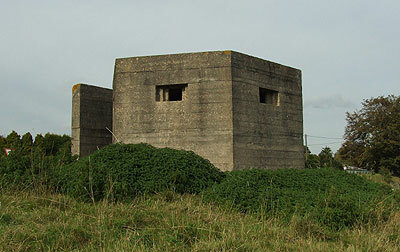 Judging by the fact that locals completely ignored my furious photography, this pillbox is seemingly visited by interested parties on a regular basis. 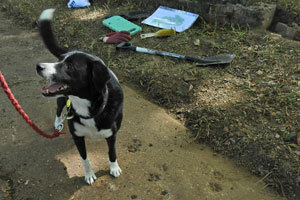 I moved off to find the canal and carry along its course. I actually missed out about half a mile from where I left off back in June, as the public footpaths seemed to move away from the canal on the north bank (where pillboxes were built), and didn't cover the full stretch on the south bank. So at the expense of missing a couple of pillboxes I decide that as the days were getting shorter, I had to push on westwards. 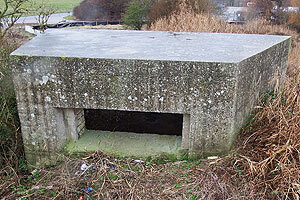 The next pillbox was this Type 22 (as were all subsequent types) at Warehorne; it was in a bit of a sorry state, the blast wall protecting the doorway having collapsed and the internal ricochet wall having been removed. 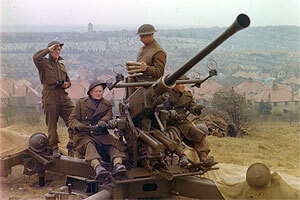 It also seems that all but the forward and small rearward embrasures had been blocked up during the war; I don't know why, but the 55 Division Defence Scheme of September 1941 recommended that only two embrasures be left unobstructed in certain pillboxes. However, 55 Div. were in Sussex and not Kent, so whether this was a universal policy is unclear. 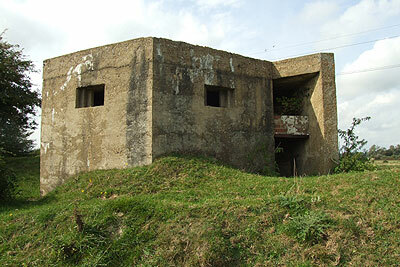 However, this is the only pillbox thus far I've seen with blocked embrasures. 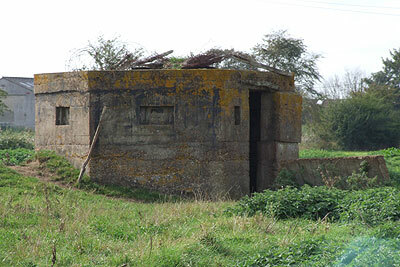 Moving along, I came across a pillbox I've been wanting to visit for some time; situated near the railway line, I've seen this one many times and attempted (unsuccessfully) to photograph it. I should make a brief mention of my bike here; I have nicknamed it the "Stuka" on account of the whining noise it makes at speed (i.e. downhill) probably due to air disturbance caused by the tyre tread pattern. My recent purchase of the pannier bags ("bomb racks") you can see in the photograph have placed all the weight over the rear wheel and have made the bike as easy to handle as our favourite fully-laden German dive-bomber with a grand piano strapped to the tailplane. The point of the panniers was to relieve the weight of the rucksack on my back, but they've lead me to loading them to full capacity and carrying a rucksack as well! To relieve the weight I ended up bungee-ing the rucksack to the top of the panniers, with my map stuffed in the elastic webbing, a decision I was later to regret. 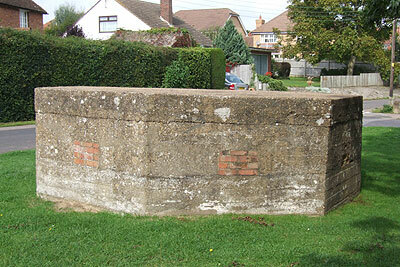 Following the canal round a bend, I found this pillbox with a brick "shelf" built across the entrance; the exact purpose of this escapes me, but I can only assume this was to provide a platform for some weapon. 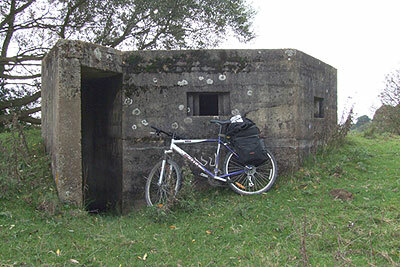 After visiting another two Type 22 pillboxes, I was approaching Appledore when I discovered that somewhere along the canal I had lost my map! I was absolutely furious with myself for allowing this to happen; not only would my old Sergeant-Major have not been impressed with my carelessness, but I had littered the countryside. I only hope somebody has since found the map and picked it up. Fortunately, I was navigating using the canal and still had my GPS receiver with me, but the loss of the map forced me onto the Royal Military Road from Appledore down to Rye, as I wasn't sure of the distances I needed to cover in order to catch a train from Rye Station. 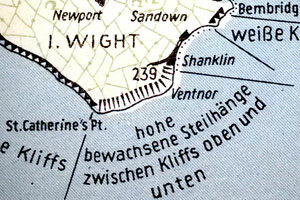 (Nowhere in Appledore sold OS maps). After quickly investigating this pillbox I caried on, but the move to the road divorced me from the canal and I probably missed a couple of pillboxes in my haste. 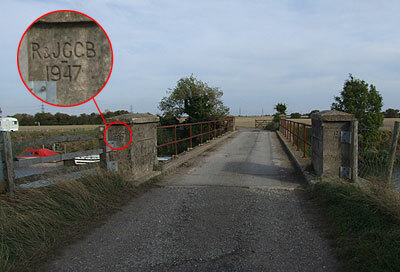 I did, however, find this bridge which was rebuilt in 1947; it transpires that it was originally blown up in 1940 by the Royal Engineers; it is listed in 45 Divisions' Defence Scheme of October 1940. Speeding up, I moved along towards Rye, where I would catch a train back home. I passed a few pimples between the road and the canal, but didn't take the time to investigate closely. Upon reaching Rye, I found a petrol station and I managed to replace my lost map. I found myself with a bit of time spare before the next train, so I quickly cycled about a mile up the road to take a look at this fine array of pimples in the grounds of an ambulance station. There were more pillboxes I was hoping to find down by the harbour, but as the evening was drawing in, I decided to leave them and the final stretch of the canal for another day.